Government of Telangana has been a pioneer in e-governance in the country. Through MeeSeva Centers and online portal, the citizens are empowered to receive the delivery of public services in a hassle-free manner. 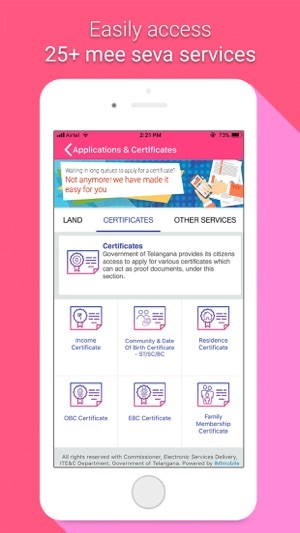 In continuation of accomplishing its vision of simplifying the processes of accessing government services, Government of Telangana is launching T App Folio - The official digital App of Telangana State. T App is available as an Anytime, Anywhere mobile service delivery gateway for all Government Departments. How to pay for availing service ? A complete cashless mode for service delivery. The Idea behind the creation of this app is good. Through this app, while applying for the caste certificate I’m able to fill all the details but unable to upload the required document. App is freezing while I’m trying to upload the documents. Request you to take a look and resolve the issues. What’s the point in developing this app? The app is working fine. But what’s the point in developing the app when the certificates applied through this app are not even viewed by the concerned officials. Again Meeseva will be the only way.. I have applied for income certificate 3 weeks back.. till this day, the status is not viewed only.. please contact the concerned officials if possible.. Sorry for the inconvenience caused. We appreciate that you have reported the same. We are already working on a fix for this issue on priority. App looks cool, went through options. 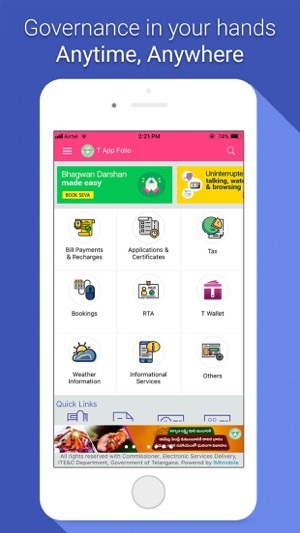 Quick question, how can we apply marriage certificate from this app, if not now by when can any enhancements planned? 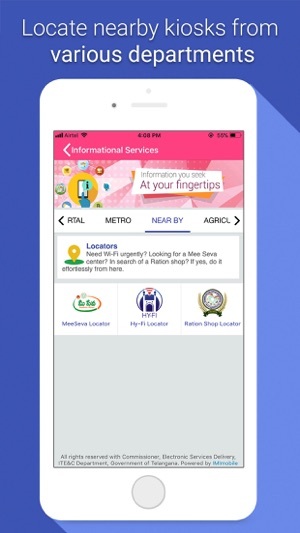 Dear Sir/Madam, we are working hard to add additional services and that this service may be integrated in the near future and you will be informed on a periodic basis over email and SMS. © All Rights Reserved with Commissioner, Electronic Services Delivery ITE&C Dept, Telangana.